No matter how big Tech N9ne gets, you can always trust in one thing: he’ll never be a sellout. 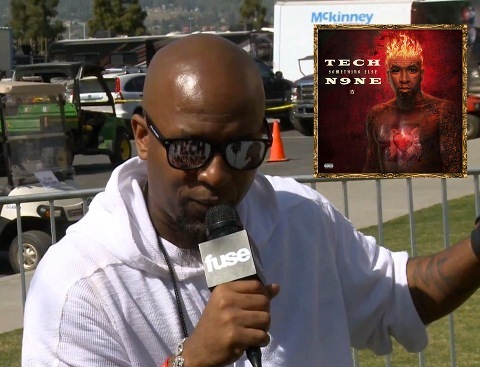 In an interview given with fuse at the Paid Dues Festival, Tech N9ne explained why that he chose to stick with the “Evil Brain Angel Heart” motif of the Something Else album cover, despite heavy resistance. It means Evil Brain Angel Heart, good and bad. That’s been my whole quest my whole time in hip hop. I just found a name for me and a face for me: EBAH. E-B-A-H: Evil Brain Angel Heart. And that’s the picture and a lot of people were scared of it, you know what I’m saying? But we went with it because I have a team that’s like “And if you feel it, I’m with you Tech.” And that’s what I need. I have to do what I feel. I’m not trying to be pretty for all these motherfuckers, I’m trying to do me. What do you think of the Something Else album art?